We’ve done many a review on cameras which assist in monitoring your home, but this might be the first time we do a review of an actual security system. Today we’re covering the 2GIG Rely Home Security Kit by Nortek Security & Control . I’m going to focus on the basic kit that we were sent, but according to your needs, you can build on it even more. 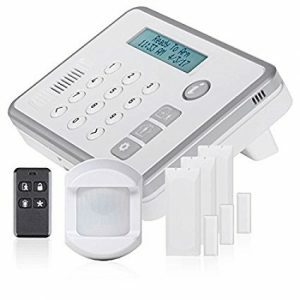 The basic kit comes with the Rely Security Panel, 3 thin door/window contacts, a passive infrared motion detector, and a four button key ring remote. The security panel is 3 1/2 x 5 x 1 inches. You can either hang it on your wall, or it sits on a flat surface with the stand to set it up at a 45 degree angle. An AC adapter and mounting screws also come included. The remote to arm and disarm is small enough to fit on your keyring at 2 x 1 inches, and comes with a lithium coin battery. The three thin door/window contacts have a magnet dimension of 1.3 x .435 x .312 inches. The sensors are 2.59 x 1.03 x .49 in. They also include batteries. Each one takes two CR2032 batteries. Finally, there is the motion detector sensor. It detects motion within a 30 ft. by 50 ft. range. It also has the battery (3 volt lithium) included. It’s dimensions are also pretty small at about 3 x 2.5 x 2 inches. It comes with a few different mounting options. It will be immune to sensing your pets up to 55 pounds. If you have bigger animals, you might need to talk with the monitoring station you use. Once plugged in, you will need to download the 2GIG Rely app available for both Android and iOS. You’ll most likely be buying your kit through a dealer, and they will be able to tell you all you need to know to get it set-up. We did not actually do the set-up, as this system requires a monitoring service through Securenet or Aventguard. Again, your dealer will tell you all you need to know about setting that up. Here’s a video that explains how to set it up with your app, though. We just received the basic kit, but you can buy more sensors, a wireless smoke/heat/freeze detector, a wireless glass break detector, window sensors, a wireless carbon monoxide detector, etc. This system really is versatile to work with your home security needs. If this product meets the need of your household, you can find a dealer near you on the 2GIG website. We haven’t been able to find the price of our basic kit, but found one with some of the extras on Amazon for $267.33. We were sent this model to review, but not to keep, and no other compensation has been offered to us for our fair and unbiased analysis.